Powerful, socially relevant drama was in store on Saturday when the Atlanta Opera presented its opening night performance of Dead Man Walking, a contemporary operatic masterpiece by composer Jake Heggie and librettist Terrence McNally. Based on the eponymous 1993 bestselling nonfiction book by Sister Helen Prejean, the harrowing memoir retells a nun’s encounter with a convict who is sentenced to execution for brutally murdering a pair of teenager lovers. Far more than an epistle on the death penalty, Dead Man Walking is an exploration of the timeless and complex spiritual issues of confession, forgiveness and redemption. Three more performances of Dead Man Walking are scheduled for February 5, 8 and 10 at Cobb Energy Performing Arts Centre. 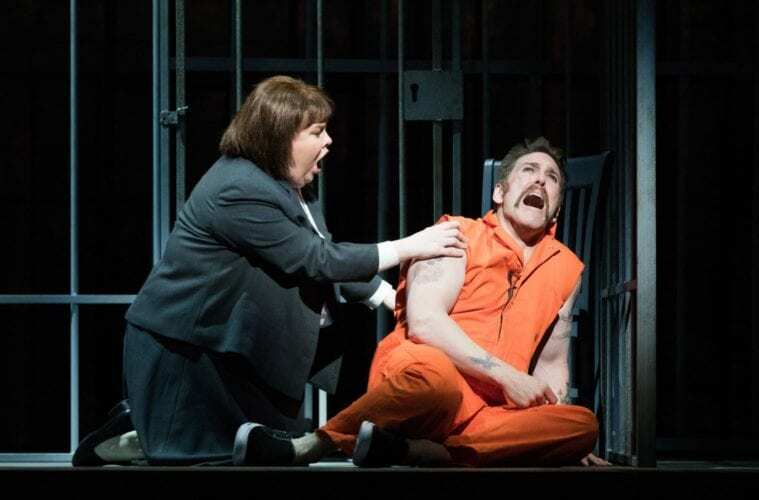 The two stars of the show are baritone Michael Mayes as death row inmate Joseph De Rocher and mezzo-soprano Jamie Barton as his spiritual advisor, Sister Helen. For Barton, it is a role debut — a genuine tour-de-force for the Rome, Georgia native, whose singing has blossomed into a distinguished international operatic career. Mayes is the quintessential De Rocher. He has performed the role in eight productions, and to date, nobody does it better. Mayes inhabits the role completely, the way a hand fits a glove. In addition to Barton, the lineup of metro residents who have solidly established operatic careers include tenor Jay Hunter Morris as prison chaplain Father Grenville and bass Kevin Burdette as Angola State Penitentiary warden George Benton. Other standouts in the cast include mezzo-soprano Maria Zifchak as De Rocher’s grief-stricken mother, bass-baritone Wayne Tigges as Owen Hart, the equally grief-stricken father of the murdered teenage girl, and soprano Karen Slack as Sister Rose, a fellow nun at Hope House. The Atlanta Opera Orchestra, led by conductor Joseph Mechavich, provided an outstanding performance that underscored the drama’s emotional angst and turmoil. 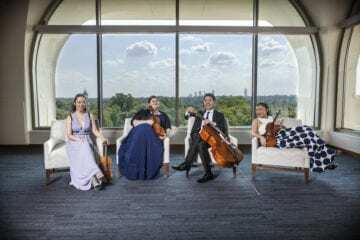 It is the orchestra that instrumentally sets the opera’s tone in the wordless Prologue to Act I, which portrays the brutal, grisly murder of a pair of teenage lovers on a date near a secluded lake in Louisiana, at the hands of brothers Joseph and Anthony De Rocher. Segue to Sister Helen alone singing a hymn: “He Will Gather Us Around.” The scene expands to her teaching the song to a group of children at Hope House, a Catholic center in the government housing projects of New Orleans. The hymn becomes Helen’s leitmotif throughout the opera, which ends with her singing it alone and unaccompanied. The story proceeds from Sister Helen’s revelation of correspondence with De Rocher — on death row for the murder of the teens — who requests that Sister Helen be his spiritual advisor. She ventures the long, hot road trip to Angola State Penitentiary to meet De Rocher. Against the advice of both the prison chaplain and warden, who suggest that De Rocher is far beyond redemption, she agrees to spiritually counsel him. De Rocher himself believes that he is beyond redemption and knows well the degree of his crimes, though he continues to deny his guilt to others, including his mother, who still believes his protective lies about being innocent. His appeals to the pardon board and to the governor are denied, leaving him to face execution by lethal injection. Sister Helen attempts to persuade him toward self-forgiveness, to ask the forgiveness of others and to find spiritual reconciliation, all of which he first resists. As the fateful execution day approaches, Sister Helen and De Rocher soon come to discover a strong common bond in the music of Elvis Presley. This allows a chance to break through the emotional stalemate — giving De Rocher ability to reconcile himself to his past actions and ask for forgiveness in the execution chamber just before he dies, strapped onto the lethal injection table with arms outstretched, like a crucifixion. Behind him, the set presents a portion of the room’s wall of concrete and steel bars, the concrete portion blatantly in the form of a cross, calling forth a visual analogy not so much with the crucifixion of Jesus, as that of the Penitent Thief crucified at his side, whom Jesus promised would be with him in paradise. The production itself is cinematic in its manner and pace, with seamless transitions between nearly 20 scene layouts spread between two acts. The stark gray set is mounted on a raised floor, slightly elevated above the actual stage floor to allow for a downstage six-foot-deep, wider-than-set segment of moving floor that can roll back and forth between offstage left and right. Other set elements are flown in and out from the riggings above — traditional stagecraft. But mostly it’s the remarkable digital projections, both static and dynamic, that recall techniques of cinematography, letting the opera’s contemporary storytelling action play out on the psychological stage of the mind as much as it does on the physical stage. Sister Helen Prejean, who authored the original book — which was also adapted into a 1995 motion picture starring Susan Sarandon and Sean Penn — was present for Saturday’s opening night performance, as was composer Heggie. Both took part in a preperformance talk prior to curtain time for early-gathering members of the audience. 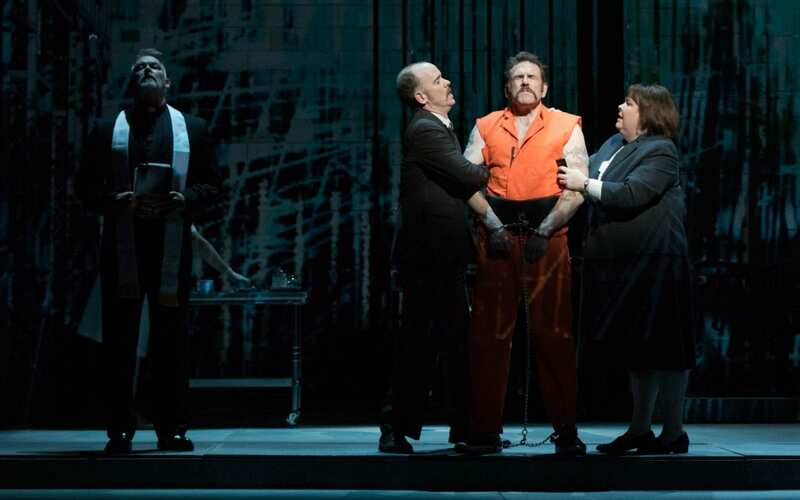 Dead Man Walking had its world premiere in 2000 by the San Francisco Opera. Since then, it has been performed in some 80 different cities and has become the most performed contemporary opera of the 21st century. The concept of this new production by the Atlanta Opera was first developed at the New Orleans Opera with Zvulun as director. It was then a coproduction with the Atlanta Opera, but in preparation for the Atlanta stage, it was given some upgrades: a brand new wardrobe of costumes was created, sets were completely rebuilt and some scenic elements were added, in ways that make it much sturdier and capable of being toured. 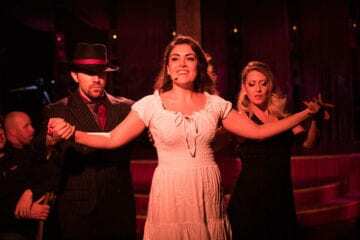 That touring capability is important, as the Atlanta performance is a coproduction with the Israeli Opera, which will be performed again this December. These same sets and costumes will be transported to Tel Aviv, where Dead Man Walking will be the first contemporary American Opera to be performed in Israel — only one sign of the Atlanta Opera’s growth from a small regional company toward a goal of becoming one of national and international importance that’s recognized for its innovative productions.